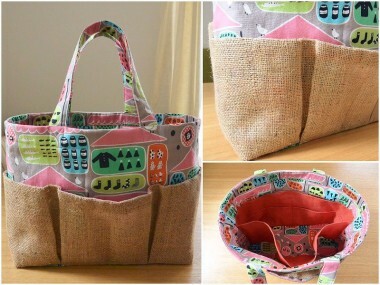 The featured project, veggie bag, is an item that is popular lately among fashion conscious people. This bag allows you to carry vegetables vertically, as if they were taken fresh out of the ground. 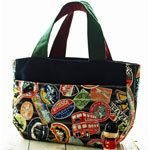 The bag can also be used as an interior décor piece. It is made in PIKKU SAARI’s kauppator (Market) fabric with a design that depicts Helsinki’s everyday life. 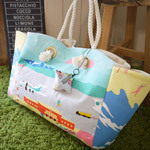 In this fabric, it makes you think that the bag can also carry a soft breeze from the lively market. It first made me think of making an item with an interior décor element. Unlike regular canvas, this one has a very nice texture, so it is suited to make coverings that come in direct contact with your skin. 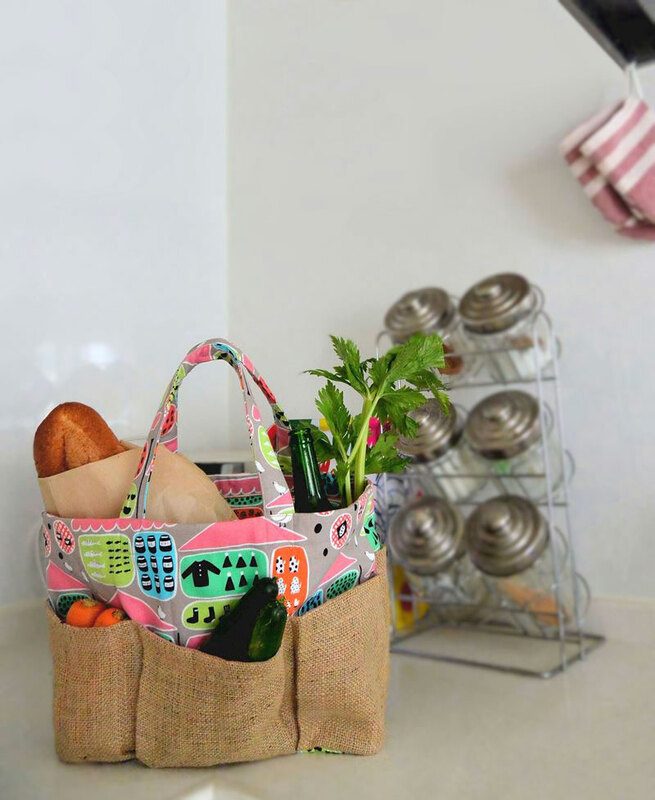 For this project, the title of the fabric gave me an inspiration, and I decided to make a trendy veggie bag that can also be used for a vegetable storage. Having multiple divided pockets is the charm of this bag. The exterior pockets have gussets and some of the inner pockets have no bottoms to prevent the bag from tipping. Many easy-to-make pockets are featured. 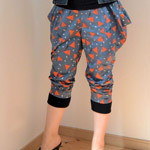 Since the larger also serves for the smaller, the size of the inner pocket is relatively big. 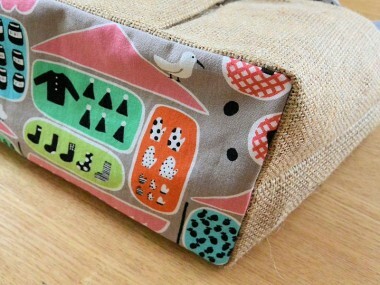 It is perfect for carrying a milk carton or a long wallet. If you are thinking of holding a collapsible umbrella or a 500ml bottled drink, then you may want to increase the stitching to create smaller pockets. An A4 size file fits perfectly in this bag. 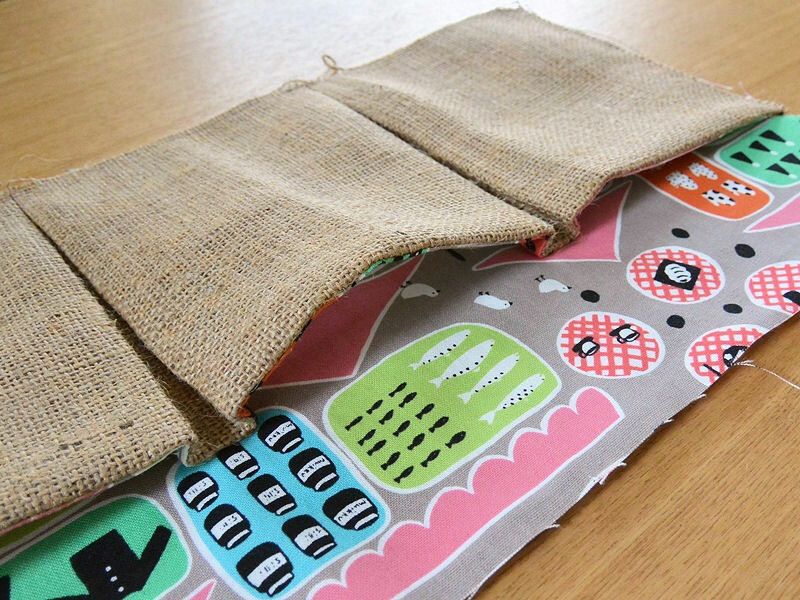 You can use it as a veggie bag as well as for an everyday piece. 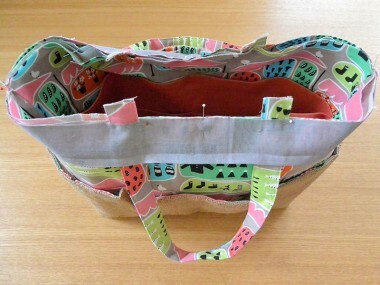 With many pockets, some mothers may find it useful as a diaper bag. If you are thinking of an interior décor piece, it can also serve as a storage. Since this is a veggie bag, a breathing cloth, jute, is used for pockets. This material frays easily, so I added a very thin opening fabric. 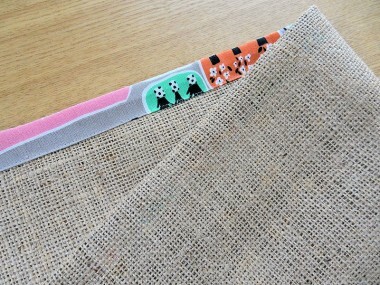 If you are using a regular fabric, you can just double fold the ends. The outer pockets are attached. 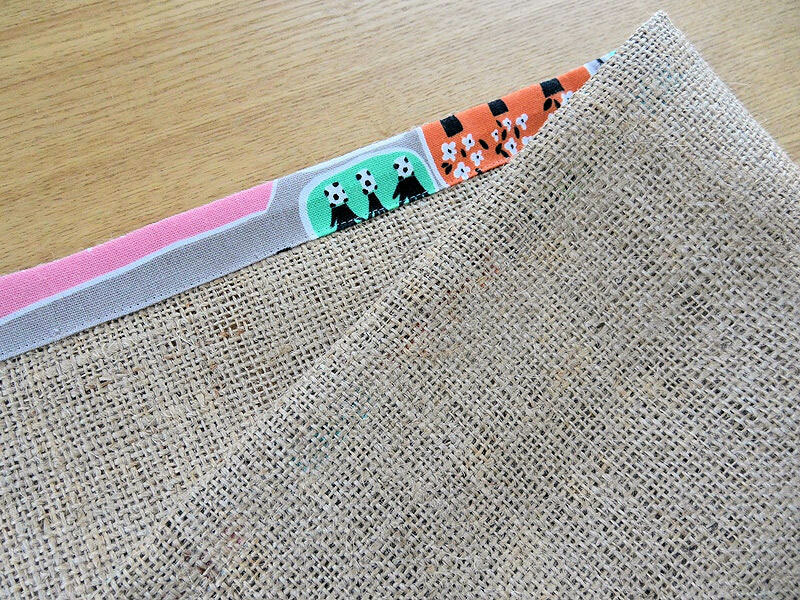 If you prefer or for materials that is hard to iron, you may want to add stitches on the crease of the tucks. My way of cleanly finish the square bottom is to start sewing from the short end. First sew both short ends, then finish with longer ends. With longer length, it is easier to make adjustment. Try not to end the stich all the way to the corner. Even if you have one stitch left, it is ok so long as you finish with proper back stitches. All pieces are sewn together here. 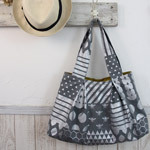 For a regular style tote bag, this method of using the opening fabric is the easiest and is recommended for sewing beginners for a clean finish. To strengthen the handles, seam width for the handle should be the width of opening fabric, and make sure to apply additional stitches at the end. Finished. 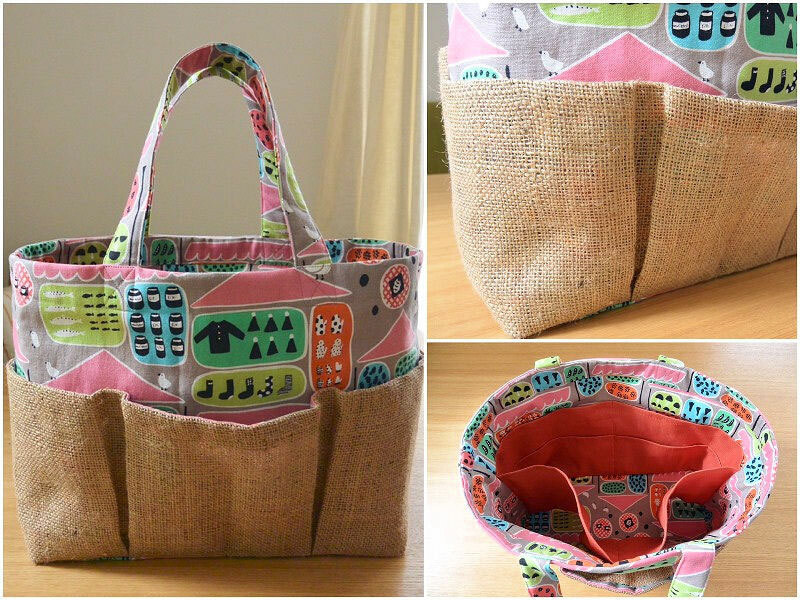 The fun open air market design, colorful inner pockets and colors that accentuate vegetables are the elements that are incorporated into this bag.